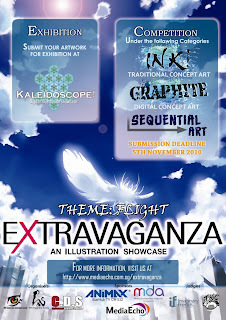 SEQUENTIAL ARTS competition, which focuses on the creation of short length comic or storyboarded works. Registration for the competition and exhibition entries begins now! Visit our booth at the upcoming A.C.M.E. Doujin event on 28th of August, or visit our website! More information on the event will be updated as the event draws nearer. Visit the Extravaganza website to learn more about the event details!